Hello! This is an update of a post I did a few years ago. Summary (from Amazon): "Over the snow, the world is hushed and white. But under the snow exists a secret kingdom of squirrels and snow hares, bears and bullfrogs, and many other animals that live through the winter safe and warm, awake and busy, under the snow. 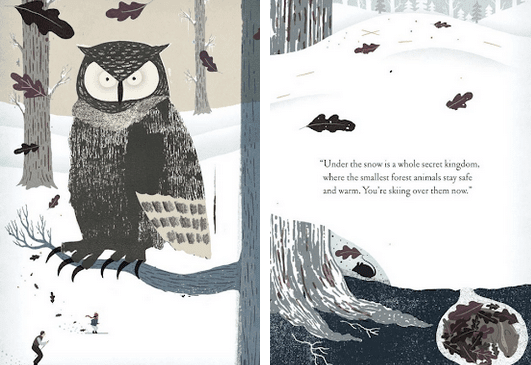 Discover the wonder and activity that lies beneath winter's snowy landscape in this magical book." Opening Lines: Over the snow I glide. Into woods, frosted fresh and white. Why I Love This Book: One of the reasons is that it fits in perfectly with what I'm teaching. But it's more than that. I just love the illustrations. I'm not sure how it was done. The inside cover just says "mixed media". But they're simple, beautiful, peaceful and enchanting. And the text follows suit. 2. 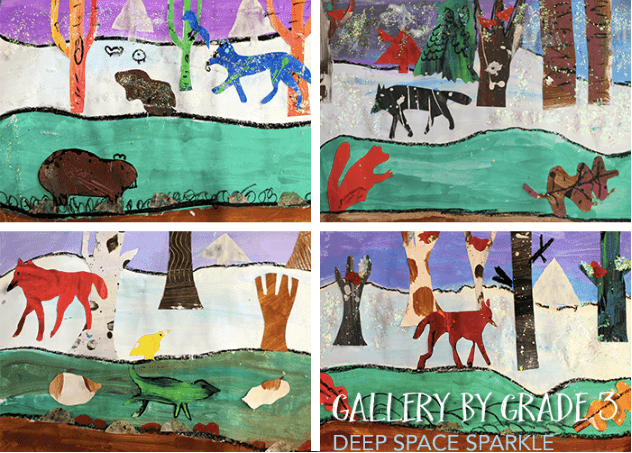 Winter Landscapes: This beautiful art lesson is free from Deep Space Sparkle. Click the pic below to find the lesson on Patty's website. 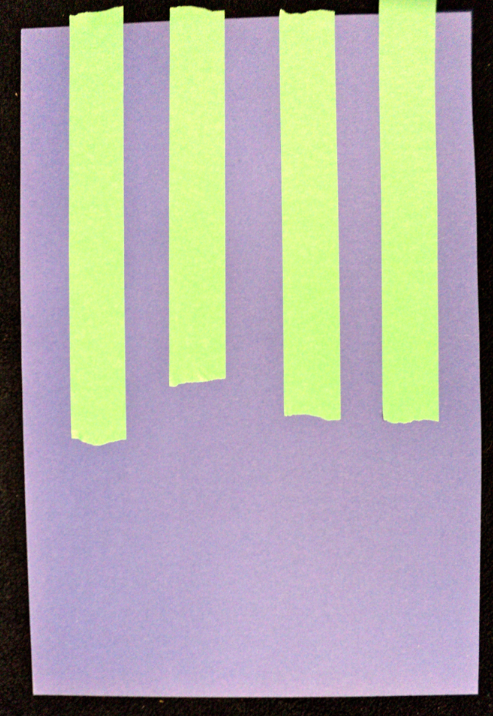 I put painters tape on construction paper. 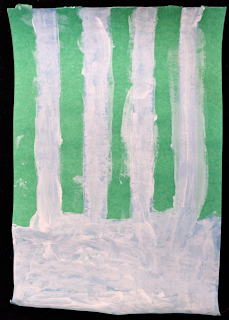 Then the kids painted the paper with white acrylic (tempera would be fine, too). 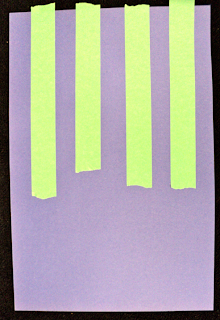 I peeled off the tape (you need to do this before the paint dries ~ it's easier to get off that way). 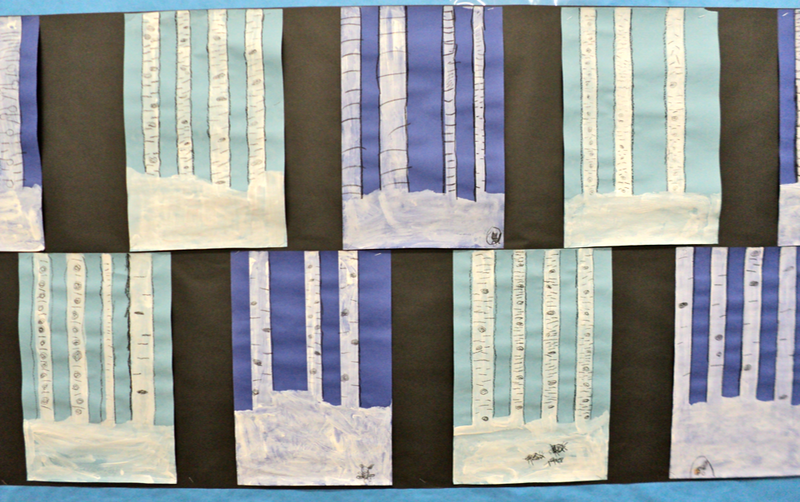 Once the paint was dry the kids used black crayon to trace the trees, add bark, and some of them chose to draw little animals under the snow. 4. 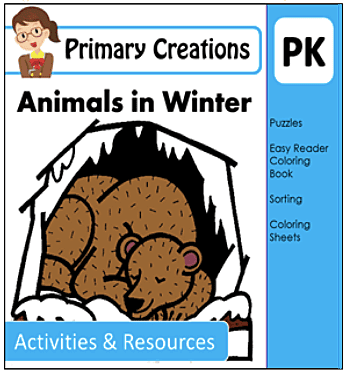 Primary Creations has this wonderful freebie called "Animals in Winter". You can click her pic to see it on Teachers Pay Teachers. 5. Under the Snow is very similar to Over and Under the Snow. If you click on the image it will take you to a post where I have a LOT more winter resources. Be sure to visit me at GRADE ONEDERFUL DESIGNS where I make, sell and give away clipart! These look like such cute books! Thanks for posting about them Barb! Looks like another beautiful book. And I love your tress. You have picked more great books! What fun tree art! That's a beautiful book. Love your tree art too! School starts for me Monday and I'm planning some winter activities with snowmen and snowflakes. It didn't get over 50 degrees here today but it's supposed to be 70 next week. Go figure! This was one of my favorite picture books of last year, Barbara. I am so glad you have added it and some super activities to our PPBF list. I picked that book up last year at the library and I am so excited to see it is in the book orders this month! The owl in it means that it must be in my classroom library! The only way we seem to be able to get snow in our forecast is to bring it in with books and polyester fill! Darn, that book was in the Scholatic book clubs last month and I didn't order it! Wish I had, now. I love this activity, so cute. The books both look wonderful, I haven't seen either of them before. I love the tree paintings. I don't do a lot of painting, but that one would be a great simple one to start with. has a cute Animals in Winter unit freebie that might go great with these books. 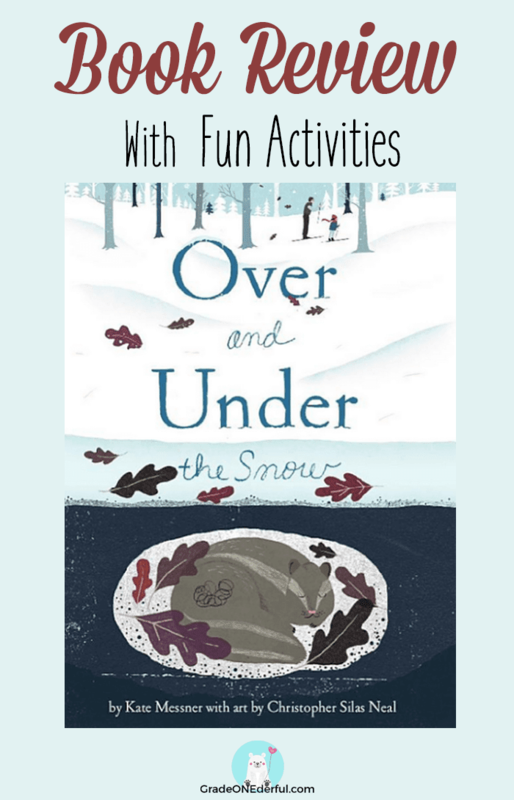 I just read "Over and Under the Snow" on Thursday. It's such a beautiful book! I like your art project. They turned out really neat. Beautiful book. Thanks for your creative art projects. Nice choice, Barbara. The pictures look beautiful in Over and Under the Snow!! I admit I sometimes buy picture books based on how the pictures look. lol. This would fit in great with our science cluster "Daily and Seasonal Changes." I love the forest animal poster idea! I will have to use that next year! 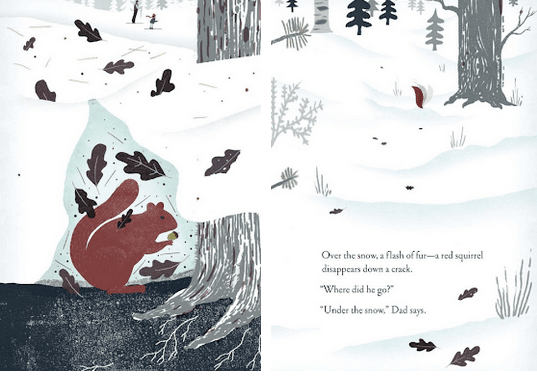 Beautiful book, and the tree project is marvelous! I love both of these books. 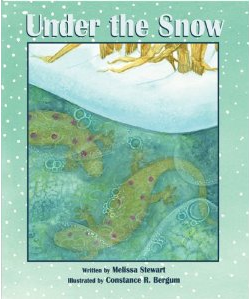 It's interesting: Stewart's, though lyrical, is straight nonficiton, while Messner's has a fictional plot line, yet teaches a lot about hibernation. Children can learn so much from both books. It's fun to read them both and compare and contrast. We don't get much snow here, but I know that we have some creatures that live underground during the winter. I can smell them. And I would love to know who's down there! 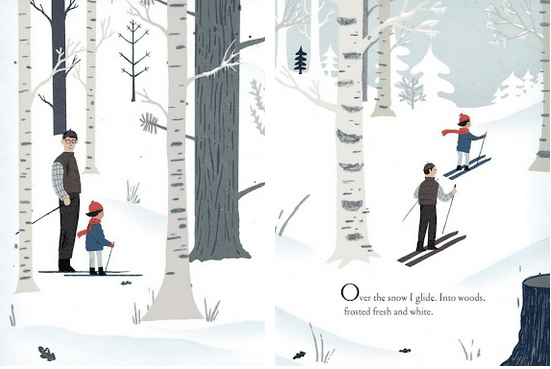 This is a pretty book -- I like the illustrations. Thanks for sharing! This is adorable! I love the detail of the story and how you incorporate it into your lesson. I'm your newest follower. I'm on my way to 100 followers and giveaway. Please stop by! Hi, I am Lily. I really like your blog it's got quite a lot to it and it looks amazing. Barb - that book is beautiful...thanks for sharing it with us. I just found your blog through a Pinterest link and I love it. I love your Friday Picture Book posts. I am always on the looking out for new books and ways to connect them - especially to art. Thanks for this book and the ideas. I've said it before and I'll say it again...you are ONEderful!!!! I love this book and I love your review. Of course, your activity ideas are just perfect! Nice job! I love the cute, simple art, Barbara!